A number of local institutions and organizations helped the Irish-Americans of Middleborough with their assimilation into American society, and in the process solidified the connection between Irish ethnicity and Catholicism. Among these groups, the most prominent social organization was the Ancient Order of Hibernians. The local Ancient Order of Hibernians division was organized July 1, 1894, as Division No. 7, and appears to have been active through at least 1917. Many communities in the region supported an A. O. H. division including East Bridgewater, Brockton, Whitman, Abington, Rockland, Plymouth and Hingham, and the local Hibernian Hall became the center of Irish-American activities within these communities. The location of the original Hibernian Hall in Middleborough is not known, though the division in 1896 established headquarters in the American Building on South Main Street “over Middleboro Market.” “The members of the A. O. H. are occupying new quarters in the American building, using the rooms formerly occupied by the [Massachusetts Catholic Order of] Foresters”, an Irish-American mutual aid society which formed a local chapter (Sacred Heart Court 96) in May, 1893. The local A. O. H. division may have been without a home for a time, as records indicate that it used various locations, including the Thatcher Block on Center Street (from about 1897 through at least 1901), the Red Men’s Hall (1901), the Nemasket Grange Hall (before 1904 through 1905) and Cushing’s Hall (mid-1905). In September, 1905, the organization found a more permanent home in the form of Boucher’s Hall on Center Street, provided through the courtesy of Thomas F. Boucher. T. D. Creedon, Michael Sullivan, E. F. Doherty, Daniel Hallisey and Edward McQuiggan were named a committee to furnish the rooms which were to include “a lodge room, hall and ante rooms”. The location became known as “A. O. H. Hall” for a time, though the occupation of the hall by the Middleboro Catholic Club (formed in late 1913), led to the hall becoming known as the Catholic Club Hall. The A. O. H. Hall was also lent to other Catholic non-Irish groups including the local French Canadian community for the organization of their own ethnic social, cultural and charitable society. There undoubtedly existed strong connections between the local Irish and French Canadians through Sacred Heart Church. The local A. O. H. maintained an overlapping membership with other Catholic groups in town, including the Knights of Columbus, Massachusetts Catholic Order of Foresters, and the Middleboro Catholic Club, which further helped define the local Irish-American community. These organizations commonly shared a mission and, not surprisingly, frequently featured similar programs. In November, 1901, the Middleborough Knights of Columbus hosted a “smoke talk” featuring entertainment including “Daniel F. McCarthy’s tenor voice [which] was heard with fine effect in ‘Come Back to Erin, Mavourneen,’ and ‘The Homestead on the Hill.’” The following year, the 16th Club, a prominent Catholic lay organization, held a concert and whist party on St. Patrick’s Day, featuring a “Songs of Ireland” program and an address on “St. Patrick and the National and Religious Observance of the Day”. Prominent among the list of attendees were Dennis D. Sullivan and Mrs. Thomas Boucher. Other entertainments featured by the Hibernians throughout the years included musical programs, minstrel shows, and a two-day bazaar in late October, 1912, which raised over $150 for the group. “The division netted a substantial return although handicapped both nights by the weather.” Dances were popular as was the annual Hibernian ball. The Hibernians first ball was held November 25, 1901, and was widely attended. John Kerrigan served as floor director, and was assisted by James H. Creedon, George Kelley and Edward Howard. Among those present were John Boucher, Michael Sullivan, Edward Howard, William Kelley, T. D. Creedon, Daniel Hallisey, Frank Murphy, T. J. Brennan, John D. Emery, Michael Mack, E. M. O’Toole, Miss Nellie Boehme, Henry Boehme, Miss Annie Cronin, Andrew Cronin, Miss Ruby Macomber, Miss Lizzie Sullivan, Miss Florence Cummings, Mr. Edgar Nevitt, Miss Nora Sullivan, Mr. John J. Sullivan, Frank H. Sullivan, Herbert Shaw, Miss Martina Callan, Miss Rose Callan, Luke Kelley, Mr. and Mrs. E. O’Donnell, Harry Belmont, George Kelley, Miss Annie Kelley, and James Norris. The Hibernians also sponsored lectures on cultural and political topics. In September, 1909, Rev. Fr. J. F. Kelleher of Brockton spoke before the Middleborough division concerning the “good of the order”, while the following month’s lecture featured a speaker from the Catholic University at Washington. The traditional St. Patrick’s night address in 1907, presented by past state A. O. H. president E. J. Slattery of Framingham, proved unusually political in tone. We are told to avoid entangling alliances, and to keep this probable entanglement from going into effect every effort must be made. The preservation of the Gaelic language is a work in which we have interested ourselves, and we are meeting with great success both in America and in Ireland, in the revival of the native tongue of our people. Our next work will be to get fair play in historic matters. Even though a misleading English history is to be found in almost every school, all we ask is that by its side a fair Irish history be kept, that fair play may be given in the education of the American child. The affairs in Ireland, tending toward better condition, are more favorable now than they have been for 700 years. The reform movement in England, resulting in the election of statesmen from the masses, will have its effects, and while we would all hope for the independence of Ireland it is not yet probable that it may be accomplished, though we may progress along constitutional lines to a better condition. The leader of the Irish people, Mr. John Redmond, is a great and unselfish leader, and under his standard and work great achievements have been accomplished. Ironically, Redmond would be marginalized in Irish politics following 1916. Given the composition of its membership, it is not surprising that the organization maintained close ties to the local church. In December, 1912, Father James J. Murphy, priest at Sacred Heart Church since October, 1911, and the local chaplain of the Middleborough, Bridgewater and East Bridgewater divisions was appointed count chaplain for the Plymouth County divisions by Cardinal O’Connell. As a whole, Division 7 was active within the county and frequent quarterly conventions of the county organization were held in Middleborough. The local division also took part in the large A. O. H. parade at Boston in 1900. Few records remain to document the operations, let alone the existence of the local Ancient Order of Hibernians division. The following roster indicates the officers who led the division as well as documented dates of service. John Kerrigan, photographic half-tone, Boston Daily Globe, "First Ball of Hibernians", November 26, 1901. Kerrigan had the honor of serving as Floor Director of the first Hibernian Ball sponsored by the local division of the A. O. H. which was held November 25, 1901, in Middleborough Town Hall. Kerrigan emigrated from Ireland in the late 1800s and came to settle in Middleborough. In 1910, he was occupied as a freight handler at the local railroad station while later in life he served as the sexton of Sacred Heart Church. 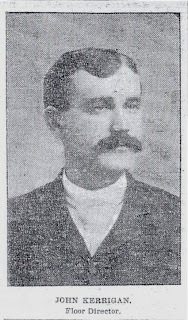 Reverend Father James J. Murphy, newspaper clipping and photographic half-tone, Brockton Times, "County Chaplain, A. O. H.", December 11, 1912. Given the large proportion of Irish who comprised the Sacred Heart parish in Middleborough, its priests (of Irish backgrounds themselves) maintained a close connection with the local A. O. H. and were frequent speakers at its events. Murphy served as pastor of the church between 1912 and 1914, and was named County Chaplain of the A. O. H. in December, 1912, by Cardinal O'Connell. Boston Daily Globe, April 26, 1901; June 29, 1901; July 1, 1901; September 17, 1901; November 22, 1901; November 25, 1901; “First Ball of Hibernians”, November 26, 1901; “Opening of Polo Season”, December 1, 1901; December 2, 1901; December 17, 1901; February 2, 1902; March 18, 1902; December 22, 1902. Middleboro Gazette, “Middleboro”, January 20, 1905, page 4; ibid., September 25, 1905, page 4; ibid., September 8, 1905, page 4; “A. O. H. Minstrels”, May 11, 1906, page 4; "Middleboro", May 18, 1906, p. 4; “Recent Deaths” [Daniel Hallisey], January 10, 1908, page 1; “Middleboro”, March 22, 1912, page 8; “A. O. H. Convention”, October 4, 1912, page 1; “A. O. H. Bazaar”, November 1, 1912, page 1; “Appointed Chaplain of County A. O. H.”, December 13, 1912, page 1; October 1, 1915, page 1; “What the Gazette Was Saying Twenty-Five Years Ago”, April 8, 1921, page 3; ibid., July 7, 1922, page 6. Resident and Business Directory of Middleboro and Lakeville, Mass. For 1895. Needham, MA: A. E. Foss & Co., 1895, page 38. Resident and Business Directory of Middleboro, Massachusetts. For 1897. Needham, MA: A. E. Foss & Co., 1897., page 127. Resident and Business Directory of Middleboro, Mass. : 1901. North Cambridge, MA: Edward A. Jones, 1901, page 152. Resident and Business Directory of Middleboro and Lakeville, Mass. : 1904-05. Boston, MA: Edward A. Jones, 1904, page 144. Resident and Business Directory of Middleboro, Mass. 1906-7. Boston: Boston Suburban Book Co., 1906, page 158. Resident and Business Directory of Middleboro and Lakeville, Massachusetts: 1909. Boston, MA: Boston Suburban Book Co., 1909, page 155. Resident and Business Directory of Middleboro, Massachusetts. 1913. Boston: Union Publishing Co., 1913, page 156. Resident and Business Directory of Middleboro, Massachusetts. 1914. Boston: Union Publishing Co., 1914, page 158. Resident and Business Directory of Middleboro, Massachusetts: 1916-17. Boston, MA: Union Publishing Company, 1916, page 149. Click on the A. O. H. icon above to learn more about the organization's history.